take action. I've even moved mine outside beneath trees in an emergency, but this must be closely supervised. Make sure their water bottles are always fresh and cool - when I come home in the afternoon, the first thing I do is to change their drinking water. When the bottles are warm or hot to the touch, the pigs aren't going to be interested in drinking. if the pig is very hot it may not be fighting you. Above all - watch for danger signs, and call your vet immediately. As with anything else, you don't have much time to act with these guys. That's why prevention is the best plan. If you have any questions, feel free to contact us. While they say at least 90% of a piggie's diet should be hay - a good quality grass hay, like timothy or bermuda, free of dust and weeds, etc, - it is also very important that they get a fresh, quality pellet designed just for guinea pigs, like Mazuri by Purina, or Cavy Cuisine or Cavy Performance by Oxbow. In addition they should get fresh fruits and vegetables, but only 1/2 - 1 cup a day, and choose carefully. While some, like the dark leafy greens like romaine are excellent, other things like potatoes and tomato leaves are toxic. Other favorites like carrots and apples are higher in sugar so limit them, and parsley is high in calcium and oxalates that can contribute to bladder stones. In general, we like to limit a pig's calcium intake when they reach adulthood, about one year of age, except with a pregnant or nursing sow. To be on the safe side, get a copy of The Guinea Pig Shopping List - download it, save it, print it, tatoo it on your arm! It not only lists the best foods for the pigs, but it breaks various foods down according to how good they are, and even lists those that are dangerous, poisonous, or just questionable, including grasses and plants (get out your plant identification book!). The important thing to remember is that guinea pigs, like humans, do not manufacture vitamin C in their bodies, so they MUST get it in their diet. When a pig needs a bit of a boost - just like us, in times of stress or when coming down with the sniffles, etc - load up on the liquids and vitamin C! Care and Handling - Who Makes the Rules? Don't tell Cinnamon he can't have his corn! but I don't add the vitamins to their water. It loses it's potency quickly, and there's no way to tell how much each one gets. Even if there's only one pig in the cage, some like to play with their water tube and will spill some. (If this get to be a problem, you can place a flat dish beneath the water to catch it.). 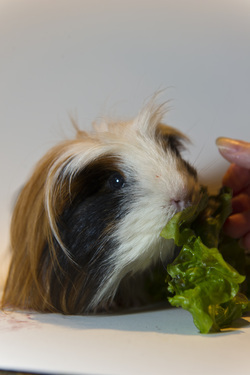 Resist the temptation to share your food with your piggie - unless you are eating from his list! 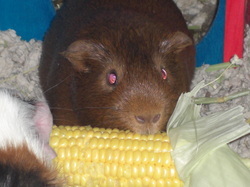 They may love to chow down on that ear of corn, but it is very high in carbohydrates and not good for them. Think about it - what do they feed to cattle to fatten them up to butcher? Guinea pigs are prey animals, and so are very timid. It usually takes some time for a new one to warm up to you, they have to know they are in safe surroundings and feel secure when you handle them. Quiety and gently pick them up with both hands, one over the shoulders and the other firmly under the rear, then hold the animal close to you. No G-Force moves - they DO NOT FLY! (well, there was that time when Mac da Roanie launched himself over the fence, but that's another story!). SMZ. Give them pennicillin and you can kill them. If they are treated with an antibiotic, they will likely need a form of probiotic, but don't give it within 2 hours of the antibiotic. There are a number of home treatments you can give, but it's important to learn what's safe and when to use it. If you can't reach your vet right away,or aren't sure if you should call, contact one of the reliable contacts online. 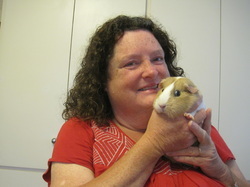 The Guinea Pig Daily Digest (gpdd.org) has the Safety Net where you can choose from a list of volunteers, according to what your needs are. There are others online, as well as other resources. Consult Peter Gurney's website for a good variety of information, others are listed at the Contacts and Useful Links sections. We keep a neat house here! Housing is basic - cages or pens should be spot cleaned daily, and completely cleaned as necessary, depending on numbert of animals, etc. There are a variety of bedding options, but avoid cedar shavings, or any other aromatic woods. If it seems to bother your animals, change it., Some people prefer toweling or carefresh. I personally use hay over newspaper, it works for us. Keep in mind that most people who believe they have an allergy to the pigs actually are reacting to the bedding, or possibly urine deposits. Cleaning bedding and good ventilation usually help the situation. The pigs don't need frequent baths, spot cleaning usually takes care of most problems. If you do bathe them, take great care in handling them - a wet pig is a very slippery pig, and almost certain to try to leap to freedom at some point - put a towel in the bottom of the tub or sink for safety. Check the water temperature, don't let soap or water get into their eyes, ears or nose, but rinse thoroughly. I like to use a mild shampoo like Head & Shoulders, but don't use flea treatment shampoos. I usually spray them afterward with a leave-in conditioner, but be sure to get the pig thoroughly dry before putting them back in their pen. You can use a hair dryer on low heat and low fan, holding it at least 6-8" away from pig, waving it constantly so you don't get one spot too hot, using your other hand to fluff the hair (as well as to hold the pig still!). Until you are comfortable doing it yourself, take your pig to your vet to have his nails trimmed - maybe every month or two, depending on how fast they grow. Most vets don't charge much for this, and it's a good chance to have the vet look at your pig - he will likely recognize any potential problems - and it gets the pig used to going to his office. Of course, take care when travelling with your pig. A pet carrier is best - they can jump or be thrown from an open box - and they will feel safer. Put a towel or bit of carpet in it so they don't slide around, and of course don't leave them in the car at any time. They will succumb to heat faster than about any other animal. I like to take a water bottle for them any time I take them anywhere, but I don't usually leave it attached to the carry during driving, as the jostling can cause water to leak out and make the floor wet. In the meantime, if their toe nails seem to grow rapidly, you can place a flat bit of rock or paver under the water bottle (raise it a bit) so they have to at least put their front feet up on the stone to get a drink. This acts like a bit of emery board and will help keep the nails worn down a bit. Just as eating hay does for their teeth - this is critical to a pig's health. They need the hay in constant supply (not just a handful once a day) for their digestion and to keep their teeth from growing too long. If their front teeth break, as they do sometimes, don't panic. If they are bleeding or very uneven, take him in to the vet to be trimmed evenly (do not clip them, this can cause splitting and further trauma), but they do grow back in a month or so. In the meantime you may need to hand feed him or cut up some of his food to make it easier to eat, but they do manage to eat again fairly quickly. Just watch to be sure they're doing ok. Guinea pigs don't need routine shots and vaccinations like our dogs and cats. For one thing, they're not outside roaming around (DO keep them indoors - there are just too many dangers outside for them!). But they do need a routine treatment for pests and parasites, like mites and internal parasites. While guinea pigs are clean animals, microscopic pests can arrive in their hay, bedding, even your other pets and your clothes. Check with your local vet, but as a rule a monthly or bi-monthly treatment with ivermectin gel or paste, along with a small dose of Panacur, is sufficient. Watch for signs of problems, such as increased scratching, bare patches, etc. It's a good idea to keep a small First Aid Kit on hand - just in case, We cover this at our workshops, usually only very basic items are needed unless you have one with a chronic problem. Your vet can advise you what else you might need.